That The French Laundry is painfully difficult to get into is not exactly news. So, when I had a chance to go last week with someone else handling all the logistics, well, the decision was easy. The story is a little funny. It sounds like one of those “cab driver’s brother’s next door neighbor kind of stories” but here you go. A former colleague is dating someone who works for a very nice woman whose oldest daughter is now at the CIA (the food, not espionage one). Only 4 degrees of separation — not so bad. Anyway, the daughter is getting ready for externships and has been visiting top restaurants in the Bay Area. She’s been to Manresa, Chez Panisse, La Toque and others. Her parents have been celebrating this research by organizing dinners at the target restaurants. Supporting your kids’ efforts isn’t always hard, I guess. So, they’d booked the private dining room at The French Laundry and wanted to fill 12 seats. Not a hard problem, but the it was a Monday night and people have crazy work schedules and have to go out of town and, and … So, at the last minute, I was a seat filler for one of my friends who had to go to a business meeting. Sad for her, but happy for me. I decided that if I was going to go up there, I might as well enjoy it fully. So, I began with an all too important pre-blow out dinner detoxification ritual. 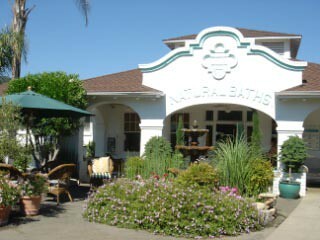 I headed straight to the Indian Springs Spa in Calistoga for a mud bath. I love Indian Springs. It reminds me of what I imagine some funky, retro LA spa would be like. If you haven’t tried it yet, what are you waiting for? The idea is simple. You go, get undressed and then get into a big concrete tub filled with hot mud. And the mud is the critical thing here. Other places use some peat based mud mixture that is smelly. At Indian Springs they use a volcanic ash based mud that doesn’t smell. Its very hot — they’ve warmed it up with the hot water from the geothermal spring. Its very plastic. And its great. You spend 10 or 15 minutes relaxing and just roasting in the mud. Then, you get out scrape it all off, shower and get into a hot mineral bath to poach. The last step is heading into the eucalyptus scented steam room for a little more heat. When you’ve had enough, you come out, shower again and then head out to cool down by the Budha garden. Fully relaxed, I was ready for the evening of serious eating. So, I hopped back into the car and headed to the southern end of the valley. Met up with my friends and headed over to the restaurant for our 7 o’clock reservation. Oh, and there was wine, of course. But that will have to wait for another day. After dinner we walked downstairs to meet some of the people who had prepared the meal. It was late, they still had work to do, but they took the time out to chat with us. Very nice. And the kitchen is unbelievably spotless, even just after dinner service. Today at the Ferry Plaza, beautiful salmon, peaches, plums, nectarines, the last blueberries of the season, mint, peppers and the ever faithful date vendor. One of the coolest displays, assembled completely by nature. Amazing ripply patters. 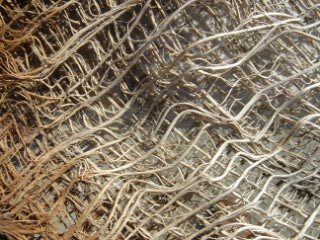 Intricately woven fibers. And no fingers involved.